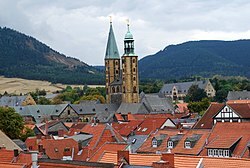 Goslar is a historic toun in Lawer Saxony, Germany. ↑ Electionresult 2011 in Goslar Archived 2012-04-02 at the Wayback Machine. This page wis last eeditit on 23 Apryle 2018, at 18:05.